Hi everyone! I’m Autumn from itsalwaysautumn.com, where I blog about crafting, sewing, cooking, photography, scrapbooking, and more. My son has a monkey named Jim from Build-a-Bear Workshop, and he wants Jim to have every single accessory that store carries. 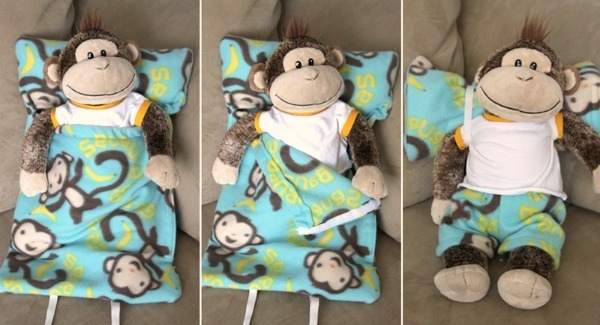 Since that’s obviously out of the question, I decided to make Jim a sleeping bag complete with a built in pillow that he can snuggle into at night. 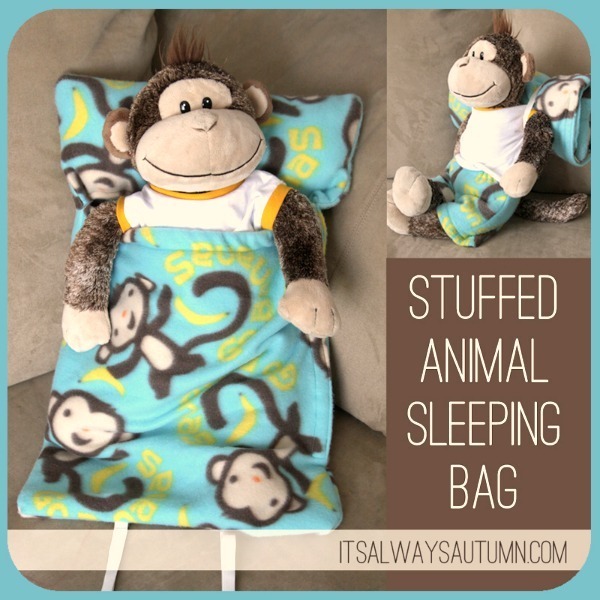 The sleeping bag is very easy–all you have to do is sew a few straight lines. 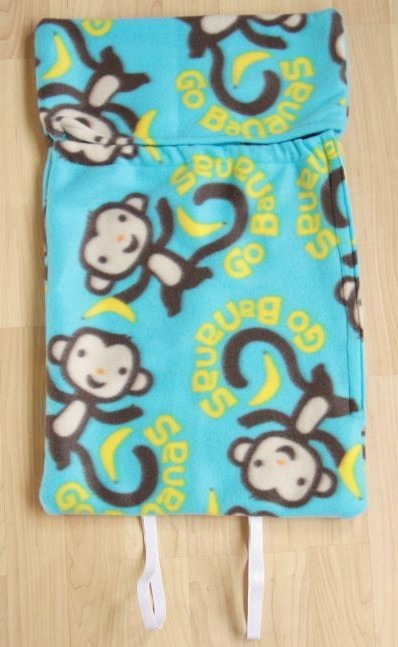 Plus it’s pretty inexpensive to make since it only takes 1/2 yard of fleece. If you buy fleece on sale and have some polyfil on hand, you can expect to spend about $5 on each sleeping bag (gift idea anyone?). It’s the right size for all the standard size/shape Build a Bear animals (on any other 18 inch stuffed animal). 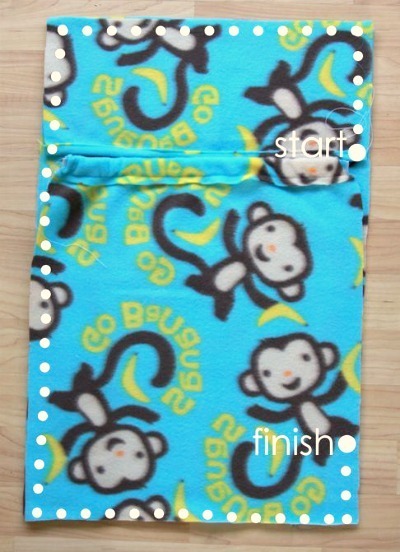 Lay out your fleece on a flat surface. It will be 18 inches wide and around 60 inches long. 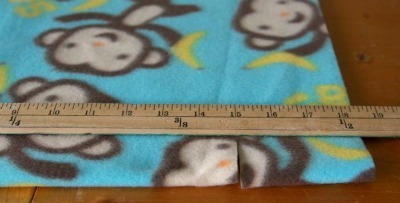 Cut three inches off of the width, leaving you with a 15 inch wide and 60 inch long piece. Set aside piece D (you won’t be using it). Set piece A aside for now. 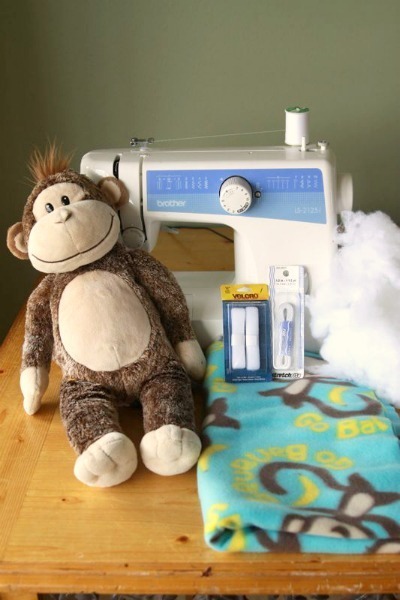 Adding elastic here will make sure the top edge of the sleeping bag stays nice and snug across your stuffed animal’s chest. Pin around all the edges. Now cut your remaining elastic into two pieces. Fold each piece in half and slide them in between piece B and piece C on the bottom edge, each one about 3 inches right or left of the center. 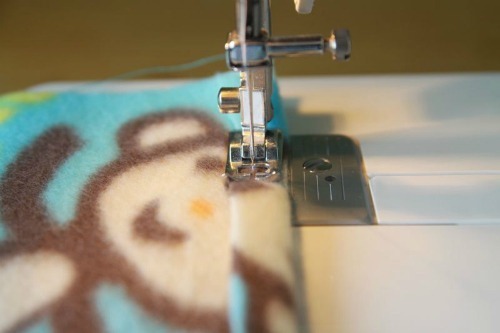 Sew along the dotted lines as shown, using a half inch seam allowance, backstitching at the beginning and end of the seam. Now, turn the sleeping bag right side out. Open up the right hand side, where you didn’t sew. 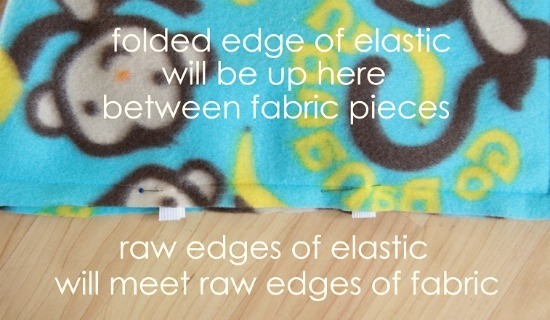 On the bottom, fold up the edge 1/2 inch and pin one half of your sew-on velcro on top of it as shown below. 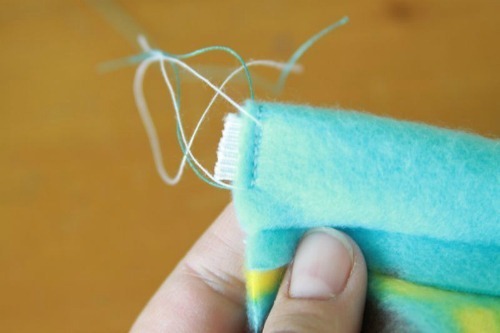 Attach the velcro by sewing around all four edges, very close to the edge. Repeat with the other half of the velcro on the top edge of the open side. All that’s left is to sew along the bottom of the pillow (sewing through piece A and piece C right along the hemline of piece A), leaving about 4 inches open. 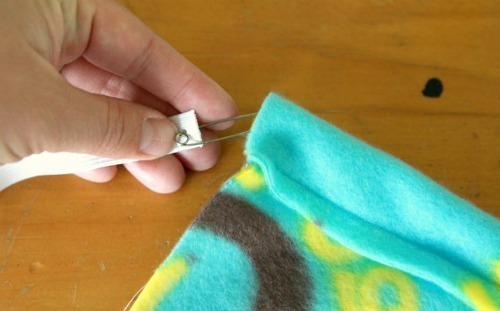 Stuff the pillow with polyfil or some other stuffing material, then sew the opening closed. 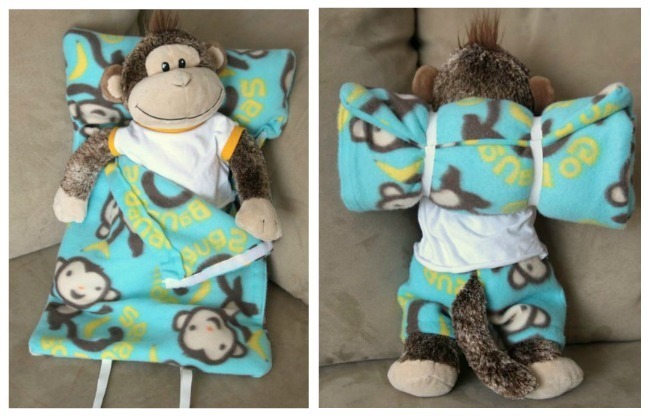 And when Jim’s not sleeping in it, we just roll it up, secure with the elastic loops, and slide the loops over his arms. It’s that simple! Remember, if you’re interesting in a free pattern download and tutorial for the jammies, click on over to itsalwaysautumn.com! Thanks! Cute idea. Love the fabric too! this is adorable and just in the nick of time! 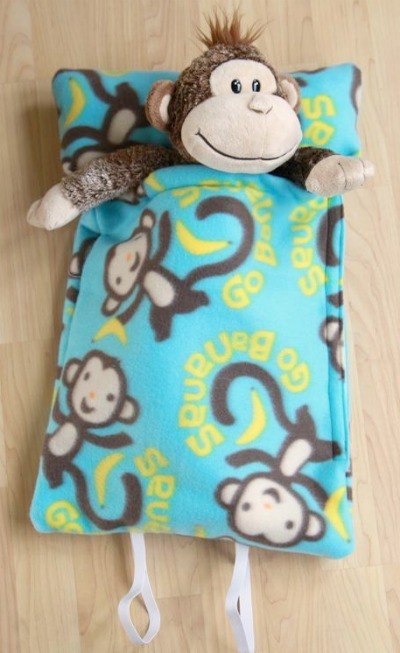 I need to make my son one asap for his birthday! Oh how cute!!! Love this! Thanks for the tutorial – I found it via pinterest. We are off camping this weekend, so the teddies will need some warmth too! Thank you for sharing this! Your directions were great, and now my boy is very happy! I love this! I made one for a webkinz panda so she can go camping anytime and anywhere! Thanks for the instructions and Happy Sewing! So cute and so easy! The instructions are easy to follow. 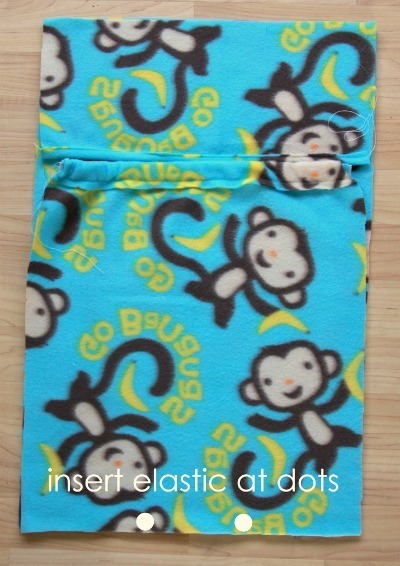 I used leftover flannel, and zippers instead of Velcro to make a couple of these for my grandchildren and they turned out great. Thanks for the idea.